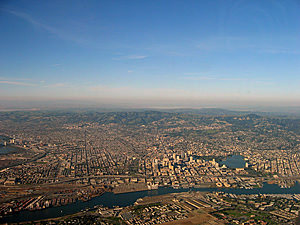 An aerial view of Alameda (foreground), Oakland (including Lake Merritt), and Berkeley (background). Add tags for "An aerial view of Alameda (foreground), Oakland (including Lake Merritt), and Berkeley (background).". Be the first. <http://www.worldcat.org/oclc/841443954> # An aerial view of Alameda (foreground), Oakland (including Lake Merritt), and Berkeley (background). schema:about <http://www.worldcat.org/oclc/841443954> ; # An aerial view of Alameda (foreground), Oakland (including Lake Merritt), and Berkeley (background).